London Boulevard – An ex-con hired to look after a reclusive young actress finds himself falling in love, which puts him in direct confrontation with one of London’s most vicious gangsters. We’re pretty even in our opinion of this English gangster flick starring Colin Farrell and Kiera Knightly that was suggested by Zebulon. There’s lots of swearing, plenty of violence, but we also found it to be suspiciously similar to Carlito’s Way. 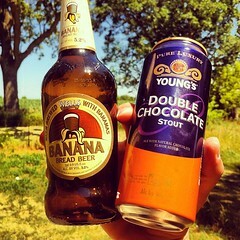 We made a beer cocktail for this episode consisting of Young’s Double Chocolate Stout and Wells Banana Bread Beer. A double chocolate banana bread stout. If you’d like to be responsible for the beer or movie we review, get in touch.